Hide Folders is an innovative software application which enables you to password protect all the private information on your hard drive. You can swiftly make your files and folders inaccessible, invisible or protect them from modification or removal. The protected folders or files are not accessible by users - no matter how they are trying to get in - locally or from the net. 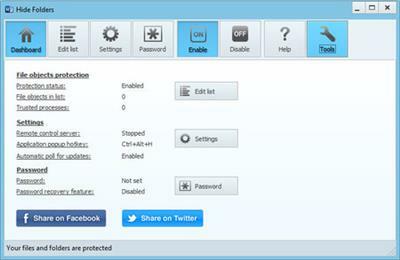 Effective protection mechanism, intuitive user interface, and set of fine-tuning options will suit the needs of everyone from novice Windows users to computer experts. Since 2001, our Hide Folders software products help our users to hide private files and folders from prying eyes.